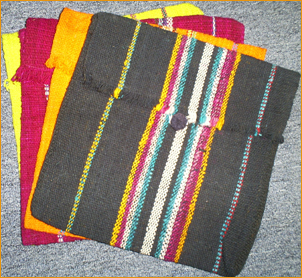 Rectangular shape; woven stripe pattern in bright colors, wood bead for front clasp, 100% lambs wool. Call or email us for color choice. Large Duffle Bag or Carry-On. 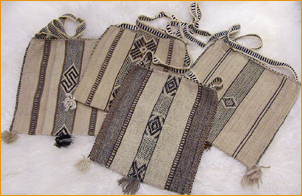 Hand woven in Peru with traditional Inca designs in light grey, black with brown stripes, or patterned black with white stripe. Cloth Lined. 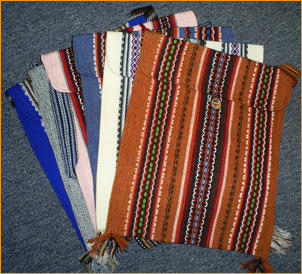 Zipper top closure with front zippered pouch. Select color option. Medium Duffle Bag or Carry-On. 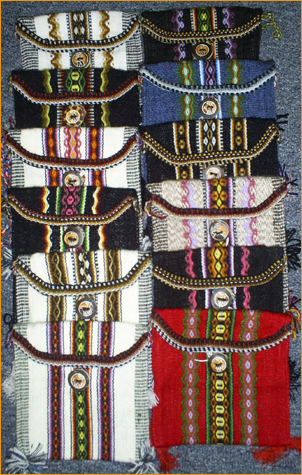 Medium size Pouch or Purse. 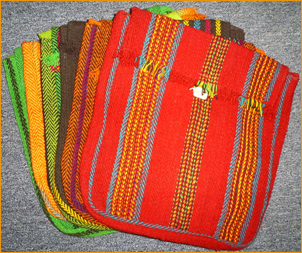 Bright colors; hand woven in Peru w/traditional banded patterns, hand carved wood button fastens front. 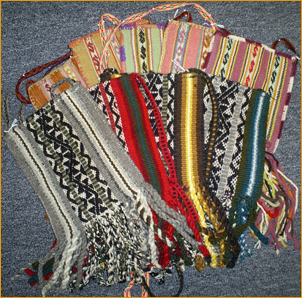 Has 2 tassels at bottom corners. 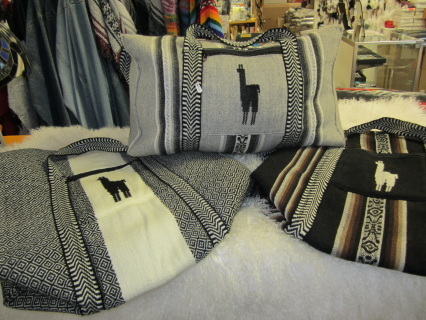 Alpaca & acrylic blend. Call or email us for color choice. 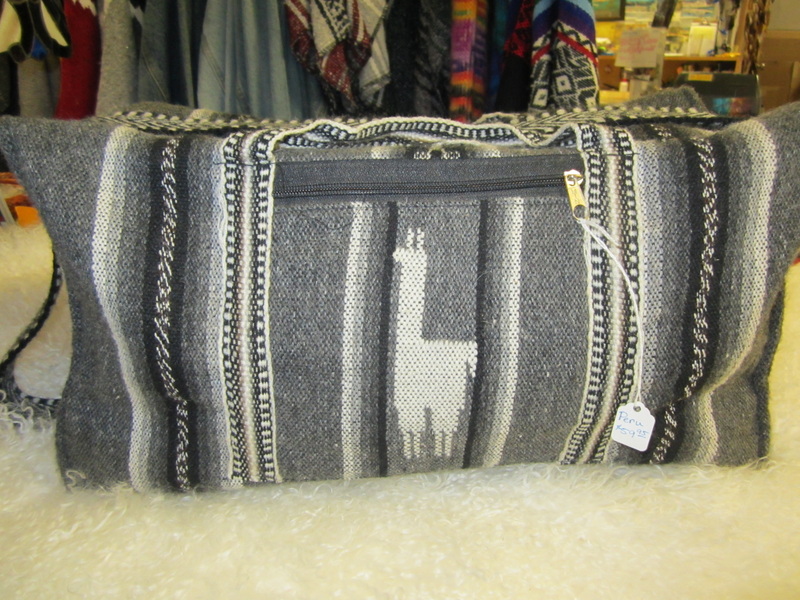 Heavy woven 100% Lambs Wool Tote with Long Thick Fringe on Bottom. Great for water bottle carrier. Colors range from pastel pinks to dark greens & blues. Call or email us for color choice and size preference. 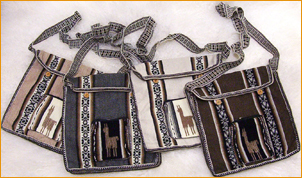 Rectangular shape; hand woven with Alpaca pattern on front zippered pocket, 2 round wooden buttons fasten top flap. Cloth Lined. Nubby Hand Woven Bag with Shoulder Strap. 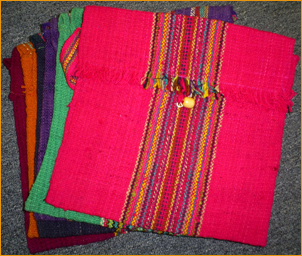 Rectangular shape; traditional Inca patterns, 3 base tassels. 50% Alpaca wool - 50% Sheep wool. Bright & Colorful Shoulder Bag. 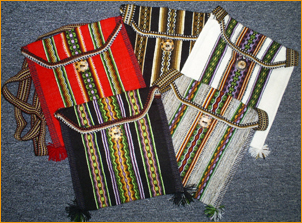 Long Rectangular shape with long fringed flap; woven pattern in stripes, 2 base tassels. 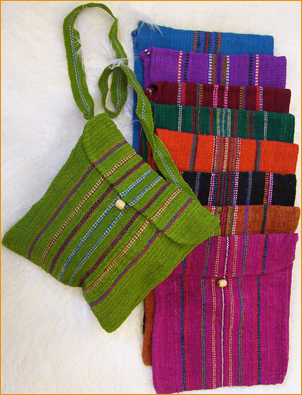 Woven Inca Patterned Tote or Purse with 1” wide Shoulder Strap & bottom fringe. Quilting lined center pouch. Top flap fastens with round wooden button, zippered front pocket. Wool/Acrylic blend. Call or Email us for color choice. 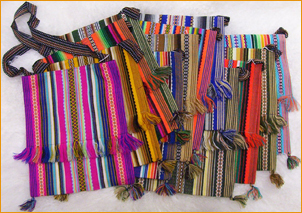 Woven Inca stripe patterned small pouch or tote with woven shoulder strap, 2 zippered compartments, 2 tassels on base. Wool/Acrylic blend. Call or Email us for color choice. 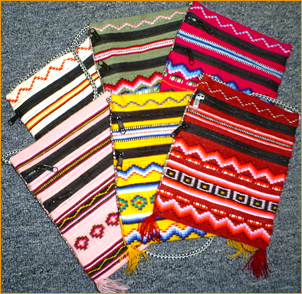 Peruvian Shoulder Bag. 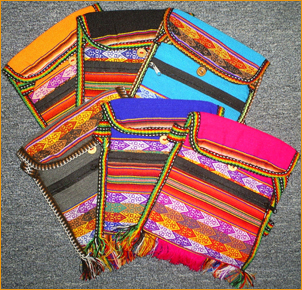 Rectangular shape;bright colorful wool/acrylic blend woven in traditional Inca stripe patterns, front flap closure with handcarved & painted wood button. Call or Email us for color choice. Rectangular shape; nubby woven stripe pattern with fringe flap & crocheted button.